Lidl's aubergines were less than 30p ea last weekend. I got to buy some. Aubergine is probably one of my favourite vegetable, if you cook it right it’s sweet, soft and scrumptiously good but if it is not cooked through it’s like eating paper pulp, strange vegetable. Moussaka and Fish Fragrant aubergine are probably my favourites. I am no expert in Greek cooking so I will just post a Chinese recipe. There is no fish in the dish. ‘Fish fragrant’ is a classic name for a Sichuan sauce made up of various ingredients like chilli bean paste, garlic, ginger, black vinegar etc…..to make a sauce which is hot, salty, slightly sweet and slightly sour. I normally brush the aubergine pieces with oil and pan fried till brown. Most Chinese and traditional way is to deep fry. The aubergine pieces do absorb most of the oil if deep fried, so it can a bit high in calories for people watching their diet. I will deep fry occasionally, it’s worth doing because deep frying gives a lovely nutty flavour a lot better than pan fried, the aubergine is so much sweeter and the the texture just melts in your mouth with a lovely red oil oozing out of the aubergines when cooked. 1. To prepare the aubergine, you can either peel or leave the skin on. Cut in 1.5cm (1/2”) thick, cubed or in thick julienne. Do cut just before cooking or it will turn brown very quickly. If you like to prepare in advance, cut and soak in water. There is no need to salt the aubergine at all, I have never found it bitter. 2. a. Normally the aubergine is deep fried for few minutes in about 1 cup of oil till brown and softened. Fry the aubergine in two batches. When done take them out and drain on a sieve for at least 15 minutes, some excess oil will come out which you can remove. 2. b. To fry with as little oil as possible, brush the pieces with oil, fry till brown and softened for about 5 – 10 minutes. Leave aside. 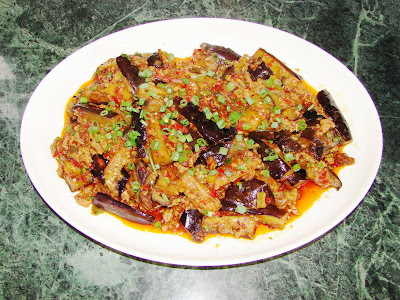 It is not necessary to cook the aubergine till completely soft, the rest of cooking is done during the simmering stage. 3. In a clean pan/wok add some cooking oil heat till hot, add the garlic and ginger stir for few seconds, add the mince pork, stir fry till fragrant and brown. Push the mince aside and add the chilli bean sauce and stir for about 30 seconds till fragrant, add light soy sauce, dark soy sauce. Add a splash of cooking wine, black vinegar and some sugar to taste. Add the aubergine pieces and enough water or stock, covered and leave to stew for few minutes till the aubergine is soft and the cooking liquid has reduced to nearly dry. 4. Thickened with a little cornflour and water. Stir in most of the chopped spring onion. Sprinkle on some chilli oil or sesame oil, do not stir. Ready to plate up. 5. Sprinkle with some more spring onion and maybe more chopped chillies for garnish. * For a vegetarian version sub mince with soaked and chopped shitake mushroom (about 3 – 5 mushrooms). You can also have this dish without any mince or mushroom. This is my favourite dish that you've given me a recipe for (and you've given me many). I love it! This was very delicious! Thank you for sharing the recipe. We are making this tonight. Can't wait. Thanks for the recipe. Came across you page and just love all your recipes. I haven't try any out yet, but will definitely soon. The black rice vinegar, It is the kind to cook the pig trotters? As I know there is 2 kind, one is the sweet and the other is the sour. Which one do I use the recipe for the fish fragrant aubergine? Also do you know where in England I could buy a chiffon cake mould like the one you got? I lived in Kent in uk. There is also another sour black vinegar normally just called black rice vinegar. chinkiang is more fragrant than normal black rice vinegar. I have already answered your question about tube tin on belly pork post.